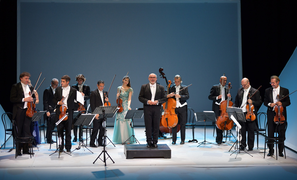 The chamber orchestra of Cameristi della Scala was founded in 1982 and is formed by musicians from the orchestra of Teatro alla Scala. In 2012 they received from the Province of Milan the Isimbardi Prize dedicated to those institutions which, with their important international activity, have contributed to the prestige of the city of Milan in the world. Cameristi della Scala has performed in the most prestigious theatres and concert halls in the world. The next October Cameristi will perform again in New York at the United Nations Auditorium. In recent years Cameristi performed for two concert series at the Carnegie Hall in New York, at the MIT in Boston and Washington. Cameristi also performed at the Paris headquarters of Unesco and Salle Gaveau in Paris, the Warsaw Opera Theatre, the Tchaikovsky Hall in Moscow, Tonhalle in Zurich, Coliseum in Buenos Aires and has toured China, Spain, Germany, France, Switzerland, Sweden, Norway, Denmark, Poland, Latvia, Serbia and Turkey. In 2010 the Cameristi went on a tour of four concerts in Israel, including one in the Mann Auditorium in Tel Aviv, and they also performed four concerts before a large audience in Shanghai with great success when they represented the city of Milan at Expo 2010. In 2011 they played in the Sony Center in Toronto and they opened the 2011 Emilia Romagna Festival in Imola. The constant and many years of attendance of the greatest conductors on the international scene, from Riccardo Muti to Daniel Barenboim, have contributed to shape the sound of the Cameristi della Scala and allowed their musical timbre and phrasing characteristics to emerge – all characteristics that are definitely unique in the Italian musical panorama of chamber orchestras.